Bosan Amarone is produced from a single vineyard of 5 hectares located in the prestigious Illasi Valley. Concentrated and full-bodied, Bosan displays jammy, raisined fruit flavors. Ripe red cherry notes envelope the palate, while subtle cocoa and vanilla notes follow on the lengthy finish. The finest dried fruit is vinified in stainless steel using the traditional Amarone production method unique to the Valpolicella and then aged in a combination of French and Slavonian oak barrels for 3 years. Opaque ruby. The 2010 vintage reveals an alluring bouquet of black raspberry, tobacco leaf and a touch of tar. It enters softly and reveals an earthy fullness and excellent balance. Sourced from vineyards throughout the Classico zone. Aged in 20% barriques and 80% Slavonian botti. A gorgeous wine on all levels. The intensity is superb as is its textural richness. 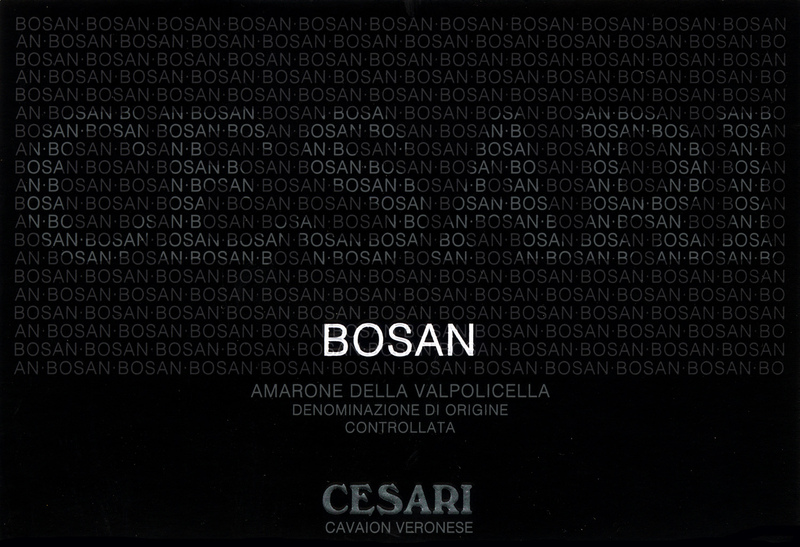 Amarone Bosan makes a big impact on the senses with towering aromas of black fruit, spice, teriyaki, barbecue smoke, resin, cola and balsam herb. The oak imprinting is relatively well balanced. I would give it another few years of bottle aging to allow further integration. Cesari has a proven track record in quality and consistency. The wines from the 2010 vintage are delicious, but the 2006 Amarone Bosan really stands out in this tasting. This graceful red seamlessly layers fine-grained tannins and juicy acidity with flavors of plumped cherry, eucalyptus, fig paste, forest floor and mineral. Drink now through 2026. Another monumental achievement, the 2005 Amarone della Valpolicella Bosan shows just a glimmer of its age with aromas of tobacco and root beer that segue to dark fruit and spice. It sits tight on the palate with thick extraction and a touch of sweetness followed by savory spice. Polished tannins stand at the back. Bosan can be consumed now, or you could wait ten years or more. Drink 2014-2025. Opague garnet. Lifted aromas of dried herbs, black plums and pepper. Luscious coating texture with an array of stewed black fruit, sweet spice and creamy oak surrounded by an acidic core. Amarone Bosan is a terrifically impressive wine with beautiful tones of polished river stone, savory spice, plum cake, root beer and liquid smoke. Sweet cherry and blackberry fl avors are folded within the wine’s rich texture and dense concentration. You’ll love it. A spicy core of ground white pepper and anise, with a touch of cinnamon, is wrapped with subtle flavors of black cherry puree, black licorice and dark chocolate shavings. Well-balanced and elegant, with a fresh finish. Drink now through 2020. Deep garnet colour. Waves of coffee, prunes and red fruit. Mouth filling palate of red cherry jam, bitter chocolate, sweet spice and cream embraced by the acidity and ending with notes of liquorice. Bosan is a beautiful Amarone with gorgeous intensity and personality. It’s a rich, ripe wine with perfectly integrated aromas of jammy fruit and exotic spice followed by pretty mineral and tobacco shadings. It’s also particularly successful in the mouth where it shows both depth and persistency. Offers an intense, complex nose, with currant and berries, together with spicy vanilla, red licorice and oak. Full-bodied, with lightly firm tannins, coated with fruit and oak. Round-textured and very pretty, but still needs time to reach its peak. Best after 2009.